Its long time since I posted a non veg snack. Sorry guys, I got trapped in the jackfruit mania. Here is a simple but tasty snack for your kids lunch box. At home sometimes we serves it for breakfast, as a lunch box snack or an after school snack for my brothers kids. They love it. Since chicken meat is lean i.e with out fat, its healthy too. Scoop out the center portion of three buns. Spread the grated cheese in the inner cavity of these buns. Mix the meat and all other ingredients together (except 1 table spoon butter and cheese). Fry the mix (#3) with the remaining butter for some time. Fill a part of this fried mix within the scooped out buns. Cover the cavity with the scooped out buns. Bake it for 8-10 minute in an oven with ghee. Serve the chicken buns hot with tomato sauce. Kids will love this recipe. Don’t forget to share the outcome with me if you have tried it. Simply drop your suggestions or comments below. Also tell me if you have prepared it with any variation (differently) and I will add it to the collection. Don't forget to try our other chicken recipes also. How to prepare Kerala special Pepper Chicken curry at home? Chicken korma recipe - How to make tasty Chicken Korma? How to make tasty chicken pockets snacks with leftover chicken? 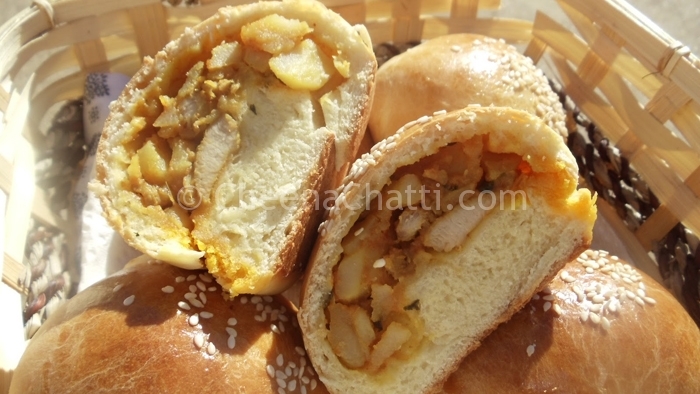 This entry was added on March 29th, 2013 by Cini P Moideen in Bakery and tagged with chicken recipe, iftaar recipes, tasty chicken bun, chicken bun, non vegetarian, ramzan recipes, non veg recipe, easy evening food recipe, how to make chicken bun. Last revised on March 29th, 2018. Recipe & Recipe photo contributed by Sherly James. OMG..these look like the chicken buns I get at a Korean Bakery nearby, BUT better! I’m glad the brioche bun dough worked well for these! I’m definitely trying them! My mouth is watering! @Lisa : Definitely its mouth watering. I have tried it myself and its really awesome. Try it and let me know how it went.